The fact that Viktor Orbán has granted asylum to his good friend, former Macedonian premier Nikola Gruevski, is a resounding slap in the face of the European values the EPP says it wants to defend. With the help of Hungary, Gruevski is a fugitive from justice. He was tried and sentenced in Macedonia for abuse of office, more precisely for buying a €600,000 bullet-proof government Mercedes from a preferred car dealer in an untransparent, corrupt procedure. “I told them the government wants to imprison me in an undemocratic way, by abusing the state prosecutor and the judiciary,” Gruevski said after he was granted asylum. Obviously, this is how Hungary understands EU asylum policy. Who said Hungary is not quick in processing asylum requests? It’s a rare and special situation. I cannot remember the last time a European country gave asylum to a former prime minister from another European country who is being or has been prosecuted. Italy’s Bettino Craxi fled to Tunisia in 1994 to escape jail. Croatia’s ex-premier Ivo Sanader fled to Austria but was turned back and brought home, where he got a sentence on one of the charges against him. Even Google couldn’t provide any more examples. Macedonia is not a country that can really boast an independent judiciary. But the case against Gruevski was solid, there was recorded evidence of what he said, and he could get away only in undemocratic regimes. The State Department has told Reuters Gruevski was convicted after a “thorough and transparent legal process”, and that he should face justice. The EU has played for time and only asked for explanations. Granting asylum to Gruevski is a flagrant violation of all European standards, committed by Hungary, a NATO and EU member which has shown on more than one occasion that it respects the rules only if they work in its favour. 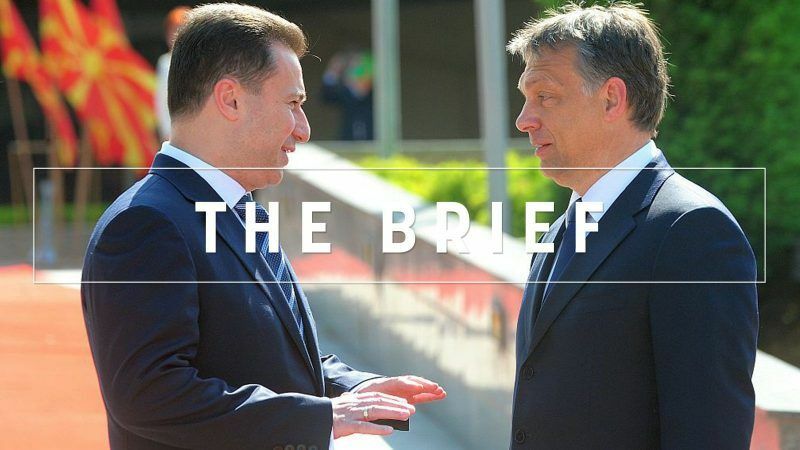 It is fascinating that, more than a week after Gruevski fled Macedonia and showed up in Budapest, there has been no reaction whatsoever in Europe. Nothing but silence. Silence from Berlin, Brussels, Vienna. As if Gruevski had just taken a holiday trip, at a time when Macedonia is trying to move away from the destructive influences of Serbia and Russia and go towards the West. Europe’s silence is surprising, but perhaps it shouldn’t be. Just as Gruevski, Orbán is affiliated to the EPP, which is panic-stricken at the thought that it may no longer be so strong after next year’s election and that it might have to do another coalition with the Socialists, or even the liberals (perish the thought). In this situation, a dozen MEPs that Orbán’s party will bring is worth more than principles. And this is how democracies go wrong. People can see and compare the justified invectives by the European Commission against the rule of law in Poland (whose government is ECR-affiliated) and the shameful silence in case of Orbán. EPP leader Joseph Daul, playing the role of a stern grandfather who nevertheless loves his grandchildren, says: “Orbán is a bad boy, but he is our bad boy”. This bad boy has just granted asylum to a fugitive from justice from an EU candidate country. New medicines developed in Europe are saving over 2 million lives a year around the world. A Brexit deal is ‘within our grasp’, insisted UK’s Theresa May after negotiators concluded a political declaration on what EU-UK relations should look like post-Brexit. Read here about the main bits and “red lines” crossed. After a tea with Commission chief Juncker, UK’s Theresa May will return to Brussels on Saturday before the Sunday summit in a bid to seal the Brexit deal. Brussels wants to act as arbitrator in cold trade war: While France and Europe are counting on WTO reform in order to stall the trade dispute between the United State and China, the EU could be turned into a collateral victim. The Commission launched an excessive deficit procedure against Italy, saying it is ‘sleepwalking into instability’. Germany, meanwhile, proposed tough conditions for a ‘European IMF’ that could help eurozone states in difficulty. Chancellor Angela Merkel’s would-be successor questions the country’s sacrosanct asylum pledge. Liberals are better at pointing out others’ faults than at doing self-reflection, says Jan Zielonka, adding that the EU has become a caricature of a neo-liberal project and needs a new vision. After the Interpol membership snub, Kosovo hit Serbia and Bosnia with 100% customs fees on their goods. Insecticides in eggs, salmonella in baby milk – how can major food scandals continue to occur, despite strict EU rules? The Commission and European capitals are not fully on the same page over plant protection as there is a lack of available substances to tackle the spread of plant diseases. Trade unions expressed concerns that Europe’s mining sector faces skilled workers shortage, which could become a problem for Europe at a time of rising global demand for raw materials. And just what is the point of recycling? Find out by reading the conclusion to our week-long Special Report. EU foreign policy chief Federica Mogherini chairs the EU-Central Asia Ministerial Meeting in Brussels as the Commission looks to thrash out a new EU-Asia strategy next year.